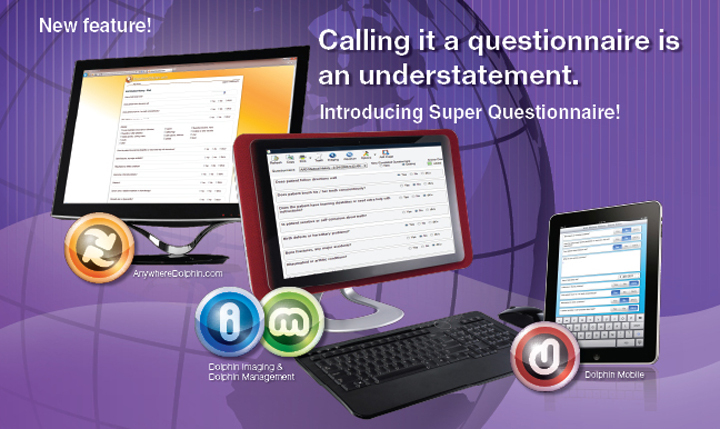 Super Questionnaire is a multi-platform feature that allows you to securely share questionnaires, surveys, medical history, informed consent, and other standard forms with patients across the Internet via AnywhereDolphin.com or Dolphin Mobile. It works across both Dolphin Imaging and Management. The form and its data are accessible via Dolphin Letters, Patient Information, Patient Document History, Treatment Card, and other relevant screens within Dolphin. New patients can complete your Medical history form, informed consent, etc.